The ski areas of Ehrwald, Biberwier and Lehrmoos are part of the “Zugspitz Arena”, a group of smallish ski areas in the Loisach valley south west of the Zugspitze, just across the Austrian border from the Bavarian resort town of Garmisch-Partenkirchen. I just spent a few days there, traveling from Munich on a ski school bus with my family. (The normal advantages of bus versus car travel, from the perspective of the car driver, apply). I was impressed. The valley, with the Wetterstein range to the north and the Mieminger range to the south, is spectacularly beautiful. I had driven through it many times, for example on the way to bigger and more famous ski resorts like Serfaus and St. Anton, but never stopped before. Now that I did, I discovered that the ski areas are good too – highly recommended for beginners and families with kids. If you're skiing with kids and/or of modest ambitions yourself, you don’t necessarily need big famous ski areas on huge mountains. Ehrwalder Alm is a small ski resort oriented to kids and families. It has some of the most spectacular scenery of any ski resort I’ve ever been to, being situated directly in the valley between the south face of the Wetterstein and the north face of the Mieminger Alps (I noted some excellent looking possibilities for summer trips in the Mieminger with my wife). The runs at Ehrwarlder Alm are shortish but pleasant, including the token “black” run that every ski resort feels it has to have – this, despite being pleasant and not too hard, had almost nobody on it, so my wife and I spent an enjoyable couple of hours one afternoon doing laps on it. Drawbacks of Ehrwalder Alm: the (otherwise rather nice) blue run back down to the valley gets very crowded in the afternoon – slalom around groups of ski-school kids who you really don’t want to hit. The restaurants are few, mediocre and overcrowded. And the only way to the top half of the resort is via an old, slow double chairlift. This has quite a steep exit ramp that tends to be frequently blocked by fallen beginners, especially in the afternoon when the snow has got a bit bumpy. Biberwier is a very small ski area - basically one quite long run (800 metres of descent), plus a little plateau at the top of the hill with a couple of draglifts that were closed when I was there because of insufficient snow. As with all ski areas where I have only been once, my perceptions are greatly affected by how the snow was that day, which in the case of Biberwier was pretty sparse and stony in places on piste. But while I was there it snowed for a couple of hours and there was some thin but rideable powder by the side of the piste; I spent my day happily going up and down that. The Sunnenalm restaurant at the top struck me as one of the nicer ski area restaurants I have visited, although this may have been helped by the fact that hardly anybody was up there. Apart from being small, Biberwier has one major drawback, namely: the only way to the top half of the mountain is an old, slow and freezing cold double chairlift. My wife was generally underwhelmed by Biberwier; I found it utterly charming and would definitely go there again – albeit only right after a big dump of snow. Lermoos is the largest of the three areas. It has lots of good beginner and intermediate runs, but there didn’t appear to be all that much for the ambitious. (We were there with two other families with small children, so “ambitious” didn’t apply to us anyway[*].) It is, however, north-facing, and the early season snow was pretty hard and nasty in the afternoon. There’s no single ski area in the Zugspitz Arena that would be interesting for anybody except an absolute beginner for more than a couple of days, but since all the little ski areas – there are a couple more that I haven’t been to – are close together and linked by buses, the area as a whole would certainly be viable for a week’s family holiday. [*] Although this will be my six year old son’s third ski season, and I have the feeling that by around the end of the season, “ambitious” for me might well mean “keeping up with him on the piste, just about”. March: my first ever snowboard tour, on some mountain I forget the name of. With my friends Pete & Mike on skis. I learned that walking up a mountain on snowshoes, carrying a snowboard, is a lot less efficient than skiing (assuming one can ski, which I can’t). And: neither snowshoes nor snowboard boots turn out to be much good for the last few metres of steep snow to the summit of [whatever it was called], which Mike danced up in his nice stiff ski mountaineering boots. Pete kindly stayed behind to look after me. Still, that was just the top bit; otherwise a fine day out with friends. May: first big hike of the season with Mike. The idea was a traverse of the Arnspitze chain, involving some scrambling/easy climbing that looks (we hoped) a lot more impressive than it really is. But we came to a short, steep bit with nasty fall potential down a gully, and we weren’t sure if we were on-route, and Mike was tired having already bivvied on top of another mountain the night before (whereas I got the first train down from Munich in the morning) so … another good but shorter than envisaged day. August: perfect weather, and I nipped out for a solo day on the Grosser and Kleiner Waxenstein. Zugspitze range again – it’s less than an hour’s drive from Munich and very scenically impressive. If you stay away from the overrun-with-tourists Zugspitze itself. The Waxensteins are actually right next to the Zugspitze, and the car park at half past four in the morning was heaving with people. On the other side of the mountain from the Zugspitze Autobahn, however, I saw nobody except a few chamois until I was heading down the hill in the afternoon. Heading down the hill having, however, discovered that my current level of practice and training isn’t up to unroped easy rock climbing in isolated situations. Coming up later in August: another big day out with Mike, and an ambitious solo overnight trip (my first mountain overnighter for a long time), both in the Karwendel Alps. Let’s see how the whole Discretion-Valour thing goes with those. Some things the internet doesn’t know yet, as I mentioned to fellow bloggers Brian Micklethwait and Michael Jennings (blog even more moribund than mine) whilst lunching with them in London last Sunday. My pro photo lab episode at home in Munich ended in tears as a result of a defective usb stick (mine, not the fault of the lab in any way), resulting in me urgently needing to get large, high quality digital prints done in London on a Saturday. Googling revealed no pro labs in central London that appeared to be open at weekends. (Lots of pro labs used to be open at weekends, to enable Saturday’s sports and theatre photographers to get their pictures into the Sunday papers. Not any more, apparently.) I didn’t want to take my precious work of art to some random one hour print place. So what to do? Indeed he is. The place has a fresh looking coat of Snappy Snaps bright yellow on the front, but apart from that it looks and feels totally like a professional lab that’s been serving the Soho journalist trade for decades. It has The Smell. The price list prominently features the correct now becoming obscure items like medium format film and slide processing. I start talking to the guy about profiles and proofs for large format digital printers, and I strongly suspect he’s the old school film guy, because he quickly calls a young lady over to deal with me. 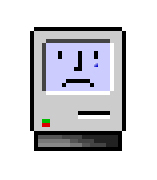 She fires up the Mac – no Windows PCs here, another good sign – and helps me choose which of the various versions of my file are going to look best on their printer. The prints, collected the next morning, are great. “Ah, but now you’ll blog this, and then the internet will know it” Brian pointed out, correctly. They say smell is the most evocative of the senses. I’ve given up on trying to print my own photos on an inkjet at home. I’m not going down the full Ken Rockwell Luddite road. I don’t doubt for a second that it is possible, by investing large amounts of time, and careful attention to calibrating and profiling everything, to get spectacular prints out of today’s high end inkjets. Michael Reichmann is no fool, and I’ve seen marvelous inkjet prints in exhibitions by world famous photographers like Andreas Gursky and William Eggleston. But you have to be willing to put in the time and effort, and I have other priorities at the moment. I was getting increasingly unhappy with my Epson R800. It only had one big flaw: murky green-tinged skin tones in shadows. But the vast majority of photos I want to print these days are pictures of grandchildren for grandmothers, so a major flaw in skin tones is a fatal flaw. I downloaded different printer profiles, I spent hours staring at soft proofs in Photoshop. Problem not fixed. I stopped using the printer a year ago and switched to online print services; last month I finally sold the printer. But last week I wanted something bigger and fancier than a run of the mill online print as a birthday present for my mother. Admittedly still grandchildren. But a big, top notch print of the grandchildren. Quick googling revealed that the Munich pro lab I used to use back in the days of film is still going, albeit under a new name and at a new location that is less convenient than the old one, but nicer. I walk through the door, USB stick in hand, and bam! That pro lab chemical smell is still there, just as strong as it ever was. Some professionals are still using film. I knew that anyway, intellectually, but I hadn’t set foot in a real lab for a long time and I wasn’t expecting The Smell to still be there. It took me back to my first few years in Munich. I was single then, working freelance, traveling a lot. I was in my first flush of enthusiasm for both photography and yoga. My life is very different now – still good, but different. It surprises me that just walking through a door I had never walked through before, and smelling a smell that used to be associated with a major part of my life, can trigger such a big wave of nostalgia. I surprised a colleague a while ago. He mentioned that he was going to hear [Irish blues/rock guitar legend] Gary Moore. Oh, I said, I haven’t seen him for a long time. Second time he was in Thin Lizzy, it was. About ’78 or so. What? he said. You’re older than you look. Me smug. I saw this Thin Lizzy incarnation at about the same time in Leicester’s De Montfort Hall, not open air in Sydney Harbour. But hey, same band, same music. Thank you, youtube, for giving me a fond boyhood memory back. I’m only just starting to appreciate the extent of the music that is on youtube these days. Could be a dangerous time-eater. So let me save you a bit of time: there’s lots and lots of Thin Lizzy live footage on youtube. This, however, is not only a stunning performance but also has by far the best sound quality. Thin Lizzy had quite a lot of personnel changes. This video isn’t the arguably Classic Lizzy Lynott-Gorham-Robertson-Downey lineup. If you want to hear that version of the band on equally impressive live form, then you need this 1975 live album available on emusic. Forget the studio albums. I don't expect everybody to appreciate rock music as an art form, but if you do, do yourself a favour. Listen. This is how it’s done. 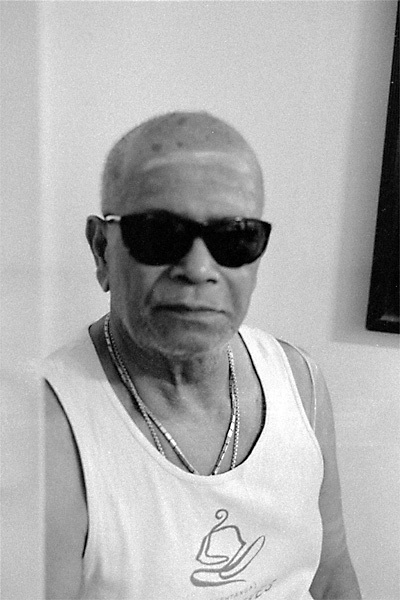 Yoga teacher Sri Krishna Pattabhi Jois, “Guruji” (dear/respected teacher) to his many admiring students, passed away yesterday in Mysore at the age of 93. 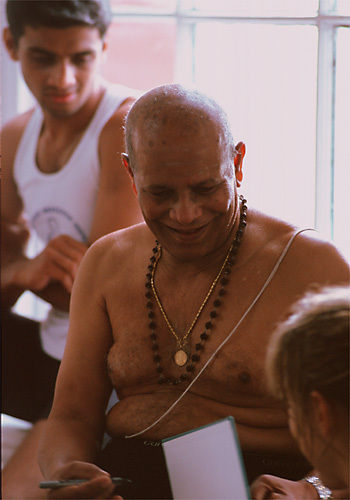 Guruji was a great teacher and an inspiration to many, including me. I think perhaps his greatest achievement wasn’t the last thirty years of steadily increasing fame and student numbers after western students discovered him and his teachings; it was the thirty or more years before that, when he kept a precious and wonderful form of yoga practice going more or less single-handed in utter obscurity until the wider world was ready for it. The Stubai Glacier, revisited eight years almost to the day after my last trip there, turns out to be much as I remembered it. I can see now, more so than I used to, why some people don’t like the exposed, bleak terrain and the lack of trees and traditional wooden Alpine huts to have lunch in. It was damn cold up there too. You never know in late March. I planned to go the the glacier because snow conditions at lower resorts can be very unreliable and unpredictable late in the season. The last time I was in Stubai at this time of year, the snow up on the glacier was fine but the run down to the valley at 1,750 metres was distinctly soupy. This year March has been cold and there was cold, dry, fresh snow in the valley all the way down to around 1,000 metres; probably most Austrian ski resorts still have decent conditions. Which at least meant that up on the glacier was quiet. We had to make an emergency stop at a ski shop to get one of those neoprene face masks for my son, who was suffering from the icy wind on the highest lifts and runs, but after that we were fine. Anyway, you don’t go to a glacier for scenery & atmosphere. You go there because nothing has thawed since October. Because, as the landlady in your bed & breakfast explains, every centimetre of snow that falls stays. You go, in other words, for powder. And the powder was great. I didn’t go far off piste on my own, but in Stubai you don’t need to – there’s plenty of great snow right under the lifts and between the pistes where you can get that amazing flying feeling where your snowboard isn’t resting on the snow, but floating through it. Which, as I explained to my wife, is what you bought a snowboard for in the first place. Pistes are just for learning. I found a nice little game to play with my son, too, to start getting him used to his first off-piste turns: slaloming round the piste edge markers. Just one turn in the deep and/or bumpy stuff isn’t too challenging, then back onto the piste. Turned out to be good training not just for him, but for me too – for example practicing that awkward powder-to-piste transition where I always used to fall over, but don’t so often any more. 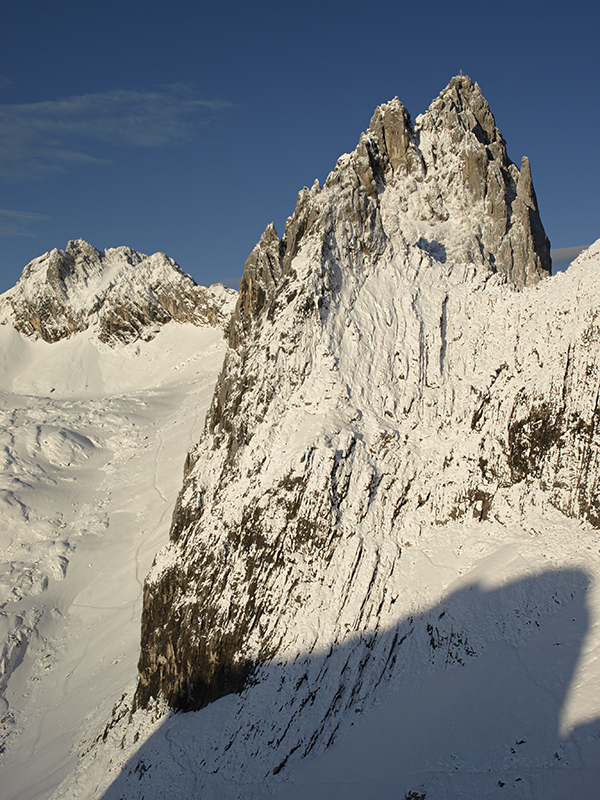 Stubai from Munich has the added benefit of being only a fraction over two hours door-to-lift. If you go the direct way over the mountains; if you’re lucky with the traffic and can take advantage of the fact that the A95 from Garmisch-Partenkirchen to Munich is one of the few remaining autobahns where “no speed limit” still actually means you can drive fast. 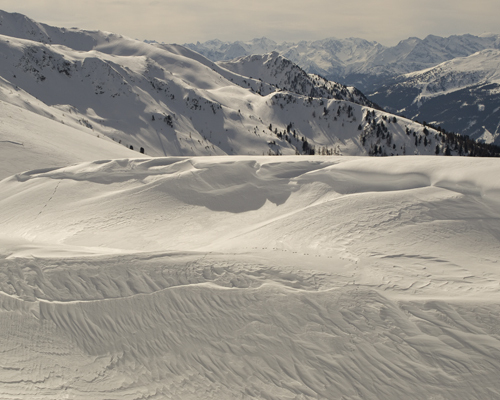 Alpbach isn’t, by any objective standard, a great ski area. It’s not very big. There are a couple of quite long and interesting red runs down to the valley, but otherwise everything is pretty short. Snow conditions aren’t particularly reliable and have been ok but not great both of the times I’ve been there. But. We spent a week there last year, another week this year and we’ve booked to go back next year. Alpbach snowscape, Austria, March 2009. It’s a nice place. Alpbachtal is a beautiful valley, and very pleasantly laid back by Austrian ski resort standards. If you’re not looking for jumping nightlife, the two villages in the valley are much friendlier places to spend time than a big heavily commercialised resort like Mayrhofen in the next valley over, even though somewhere like Mayrhofen might objectively have much more and better skiing. I couldn’t honestly recommend Kranzberg as a snowboarding destination but, should one happen to find oneself in the area, there’s a fun afternoon to be had there. I was in Mittenwald last month for a friend’s fortieth birthday party, and spent a very pleasant Sunday afternoon on the Kranzberg. Mittenwald is a Bavarian mountain town, famous according to the tourist brochures for violin making, situated between the Wetterstein and Karwendel Alps. 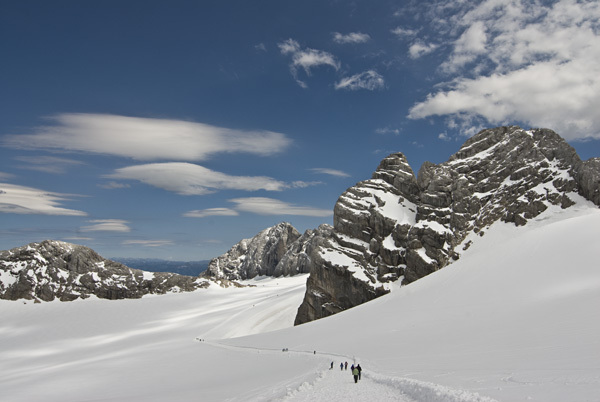 The Wetterstein and Karwendel are steep, rocky, heavily protected in the case of the Karwendel by National Park status, and almost entirely unsuitable for skiing. But almost every Alpine town manages to find some ski possibilities somewhere. Mittenwald has the Dammkar: a single ski run dropping well over a thousand metres from the top of the Karwendel, reached by a cable car, avalanche patrolled but not pisted. It’s supposed to be steep, long and great fun. Three or four of us middle aged guys at the party were keen to demonstrate our continuing manhood on it, but in the end we decided it would be unsociable, and we should do something else instead that was fairer for the non-skiers (and for the skiers with nothing to prove, such as our wives). Mittenwald also has the Kranzberg, a small foothill of the Wetterstein that has some ski runs. 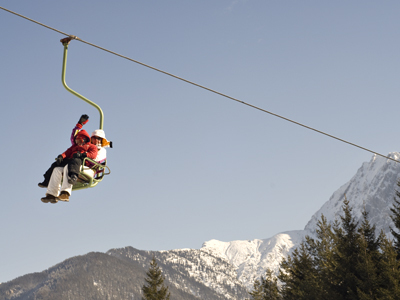 The Kranzberg is reached from the edge of town via a little single-seater chairlift. The lift is old and slow, but on the leisurely journey you have plenty of time to admire the idyllic, gently rolling parkland that it passes over and the impressive view of the Wetterstein. 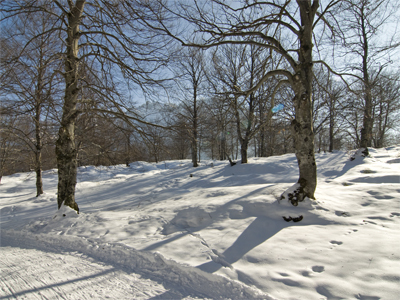 It leads to to a toboggan run – ideal for the non-skiers – and an alleged ski run. Small children, sledges and snowboards (ideally not all at the same time) are carried on laps. If you thought “idyllic, gently rolling parkland” isn’t a landscape description you’d normally associate with a ski area, you’d be right. The blue run back to the chairlift is very scenic, but it is also the least downhill-sloping ski run I have ever seen. Probably great fun for lazy ski tourers, but not at all on a snowboard. The other (north) side of the mountain is somewhat more normal, with ski runs that actually go downhill most of the way, reached by a couple of quite steep draglifts. The runs are short but pleasant, and every snowboarder should practice draglift skills from time to time, however reluctantly – you never know when one of the accursed things might obstruct your path to an otherwise decent bit of mountain. As I’ve said before, “if I’ve only been somewhere once, please assume that my rating is heavily biased by whether the snow there happened to be good or bad that day.” It’s hard to avoid having fun on a snowboard anywhere where there’s half a metre of fresh snow by the side of the piste, and the piste-side snow last weekend at Kranzberg was lovely. I found a(nother) website dedicated to quaint and obscure German ski resorts. Here’s what they have to say about Kranzberg. I only visited Hochfügen once, a long time ago, but I was impressed and I’m keen to go back. The top of the ski area is a huge bowl of powder snow. It was when I went there, anyway, which was admittedly the day after a big snowfall. It’s high up for a non-glacier resort (as hinted at by the name “Hochfügen”) and generally has a reputation for good snow. There are also long, steep and interesting looking red and black runs down in the trees. And a lift connection over the other side of the mountain to the huge Hochzillertal ski area, which I’ve never visited but I suspect there would be little danger of running out of things to do. On Sunday I went snowboarding at Spitzingsee by train on the Bayerische Oberland Bahn. There’s a lot to be said for not driving to the mountains. As with taking the bus, there’s a minor amount of hassle getting self and gear to & from the station, but then you can sit and read or listen to music or sleep. And coming back in the evening when you're tired from a hard day in the mountains is a lot safer and more pleasant if you fall asleep on a train, than if you fall asleep driving on the autobahn. (My family don’t really appreciate this benefit, since they listen to music or sleep anyway while I drive). Door-to-lift time to Spitzingsee for me by public transport is under two hours. Under an hour door-to-lift is theoretically possible by car, assuming no traffic jams, but assuming no traffic jams on a sunny Sunday after it just snowed for three days would be foolish. I really don’t fit the snowboarder demographic on the BOB though. The rest were teenagers on their way to Spitzingsee’s “Burton Funpark”. “Fun” meaning, in this case, terrifying-looking leaping around in the air. Tricks are for kids. It really struck me just how beautiful these young people are – these being, of course, fit, athletic young people cheerfully heading out for a day’s play with their friends. My son, I found myself thinking, might be one of these beautiful young men in ten years or less, off in search of adventure with his friends. If he is, I hope the young women he travels with will be just as beautiful as the ones today. I also hope he’ll be able to think of a way to impress them without risking his neck leaping around in half-pipes – which just means I’m finally beginning to understand how my climbing was for my mother. I was just back from two weeks’ family holiday, and I had decided to award myself a day of Me Time. Snowboarding alone has its disadvantages, though. It’s not safe to do any kind of serious off-piste. The Bavarian avalanche warning service said the risk level below the treeline on Sunday was moderate, but avalanches aren’t the only bad thing that can happen to the hapless lone mountain-goer. Not by a long chalk. Quite apart from danger, there’s also the social embarrassment of looking like Johnny No Mates. But reality must be faced, and part of my current reality is that I do indeed have no mates near at hand who are able or willing to abandon their families at short notice for a day out in the mountains. I still had a great time. And next weekend I go out for my first ever serious off-piste tour with two of my middle aged dad mates – planned and approved by our wives long in advance. Excellent Spitzingsee tip from my colleague Ketil: on a good day, when the main runs from the Stumpfling and Sutten lifts are sure to be unpleasantly crowded, take the old Taubenstein cabin lift up the other side of the valley instead. No lift queues, quiet pistes, better snow even. There’s a nice little safe & easy powder slope to warm up on between the blue pistes on the Maxlrainer draglift. I feared the Rosskopf (Stallion’s Head) draglift at Spitzingsee when I first saw it, almost exactly a year ago. Looking across at it from the top of the main chairlift, it looked to be the steepest and fastest draglift I had ever seen. So yesterday I went on it. It’s ok. It is indeed very steep for a draglift, but it doesn’t feel as fast as it looks and it’s only short. As it turns out, it’s probably a good thing that the Rosskopf has an intimidating-looking lift. The top hundred metres or so of the unpisted black run down the front of the mountain are very steep indeed. In anything other than yesterday’s perfect snow, it would be one of the hardest things I have ever done on a snowboard. Yesterday it was fun – just. I think I just missed the tenth anniversary of my arrival in Germany. Kind of. Kind of not, because although I was actually in England on the day, one of the main purposes of my visit was to clear out some of the last vestiges of my presence in a country I have no great interest in ever returning to. Much of today, then, spent in my brother’s attic sorting through boxes, and discovering that hey, I belong to probably the last letter-writing generation. It’s something I had completely forgotten about because I’ve hardly written any in the last ten years or more. But I turn out to have several shoeboxes full of ones people wrote to me back in the 1980s. And if people were writing to me, I presume I must have been writing to them too. I remember thinking when I started using the 'net in the mid 90s, how much better email was for keeping in touch with old friends than a Christmas card once a year. In some ways it is. But there’s a investment of effort and commitment in sitting down and writing four or five pages by hand, intended for and thinking of one person and that person alone, that just isn’t there any more. Still visiting family in England, and discovering what a dark and dangerous place the internet feels like these days to people who have Windows on their computers. My parents have been intending for a while to get a new PC, and consequently didn’t bother keeping up the maintenance payments on the virus software on the old one. Don’t go on the internet, I am warned, the virus scanner isn’t up to date. My brother had a virus outbreak on his PC, apparently, and prefers not to hook it up to the internet unless he has a pressing need to send an urgent email because, he says, he feels the need to run a full virus scan immediately afterwards. Sometimes I’m so glad to be using a Mac.